اندازه بنه مادری، مدیریت تغذیه­ای و نوع بنه از مهم‌ترین عوامل در تعیین عملکرد و کیفیت زعفران ((Crocus sativus L. به شمار می­روند. به‌منظور بررسینقش وزن بنه مادری و محلول­پاشی برگی بر عملکرد گل و بنه دو توده زعفران ایرانی و اسپانیایی آزمایشی طی دو سال زراعی (94-1393، 93-1392) در مزرعه تحقیقاتی دانشکده کشاورزی دانشگاه فردوسی مشهد انجام شد. آزمایش به­صورت فاکتوریل و در قالب طرح بلوک­های کامل تصادفی با سه تکرار انجام گرفت. تیمارهای آزمایش شامل نوع بنه در دو سطح (ایرانی و اسپانیایی)، وزن بنه مادری در سه سطح (8 - 1، 15- 1/8 و 23- 1/15 گرم) و محلول­پاشی برگی در دو سطح (صفر و 7 درصد کود ­کامل شامل فسفیت پتاسیم و بیومین) بود. بر اساس نتایج آزمایش، با افزایش وزن بنه مادری، تعداد گل در هر مترمربع، وزن گل­تر و عملکرد کلاله خشک زعفران به‌طور معنی­داری افزایش یافت. علاوه بر این، استفاده از بنه مادری بزرگ‌تر به‌طور معنی­داری منجر به افزایش تعداد بنه دختری و عملکرد کل بنه­های دختری شد. اثر محلول­پاشی برگی نیز بر تعداد گل در واحد سطح و عملکرد کلاله خشک زعفران معنی­دار بود، ولی بر تعداد کل بنه دختری در واحد سطح تأثیر معنی­داری نداشت. اثر نوع بنه بر تعداد گل در واحد سطح، وزن­تر گل، وزن خشک (کلاله + خامه) و وزن خشک بنه معنی­دار بود؛ بنابراین، بیشترین تعداد گل (6/48 در مترمربع)، وزن­تر گل (3/24 گرم در مترمربع) و وزن خشک کلاله + خامه (25/0 گرم در مترمربع) مربوط به اندازه بنه مادری 1/15 تا 23 گرم و کمترین مقدار مربوط به اندازه بنه کمتر از 8 گرم بود. همچنین بیشترین تعداد گل (7/43 در متر­مربع)، وزن‌تر گل (8/21 گرم در متر مربع) و وزن خشک گل (23/0 گرم در مترمربع) طی دو سال آزمایش مربوط به بنه­های ایرانی بود. بر اساس نتایج، استفاده از بنه­های مادری ایرانی با وزن مناسب جهت کاشت (بیش از 15 گرم) همراه با محلول­پاشی برگی می­تواند در افزایش عملکرد گل و بنه زعفران مفید باشد. The corm size, nutrient management and corm type are the most important factors that may affect the quantitative and qualitative characteristics of saffron (Crocus sativus L.). 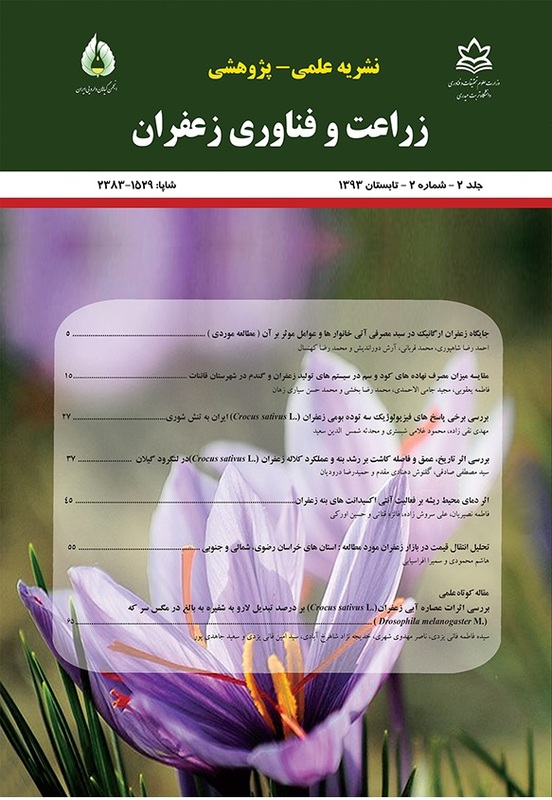 In order to study the effect of mother corm size and nutrient foliar application on flower and corm yield of Spanish and Iranian Saffron landrace, an experiment was conducted with factorial arrangement based on randomized complete block design with three replications during two growing seasons (2013-14 and 2014-15) at the Faculty of Agriculture of the Ferdowsi University of Mashhad, Iran .The saffron corm type was considered in two levels (Iranian corm and Spanish corm), mother corm size were in three levels (1- 8g, 8.1- 15g, 15.1- 23g) and nutrient foliar application were in two levels (control and sprayed leaves with 7% micro and macro nutrients). The results showed that the effect of different mother corm size, corm type and nutrient foliar application on the number of flowers, flower fresh and dry weight (stigma + style) were significant. The highest number of flowers (48.6 flower.m-2), flower fresh weight (24.3 g.m-2) and saffron (stigma + style) dry weight (0.25 g.m-2) were obtained in 15.1-23g mother corm size, and the lowest were obtained in 8g > mother corms. In contrast, nutrient foliar application had not significant effect on total produced daughter corms. However, the highest number of flowers (43.7 flower.m-2), flower fresh weight (21.8 g.m-2) and stigmas dry weight (0.23 g.m-2) were obtained from Iranian corms in the second year. Hence, the use of appropriate weight for planting Iranian corms (over 15 g) with nutrient of foliar application can be useful for increasing the performance of the flowers and saffron corms. Amirshekari, H., Sorooshzadeh, A., Modaress Sanavy, A., and Jalali Javaran, M. 2007. Study of effects of root temperature, corm size, and gibberellin on underground organs of saffron (Crocus sativus L.). Iranian Journal of Biology 19: 5-18. (In Persian with English Summary). Behdani, M.A., Koocheki, A., Nassiri Mahallati, M., and Rezvani Moghaddam, P. 2006. Evaluation of quantitative relationships between saffron yield and nutrition (on farm trial). Iranian Journal of Field Crops Research 3: 1-14. (In Persian with English Summary). Ghobadi, F., Ghorbani Javid, M., and Sorooshzadeh, A. 2015. Effects of planting date and corm size on flower yield and physiological traits of saffron (Crocus sativus L.) under Varamin plain climatic conditions. Saffron Agronomy and Technology 2 (4): 265-276. (In Persian with English Summary). Gresta, F., Lombardo, G.M., Siracusa, L., and Ruberto, G. 2008. Effect of mother corm dimension and sowing time on stigma yield, daughter corms and qualitative aspects of saffron (Crocus sativus L.) in a Mediterranean environment. Journal of Food Science and Agriculture 88: 1144-1150. Hosseini, M., Sadeghi, B., and Aghamiri, S.A. 2004. Influence of foliar fertilization on yield of saffron (Crocus sativus L.). Acta Horticulturae 650: 207-209. Khorasani, R., Rezvani Moghaddam, P., and Hassanzadeh Aval, F. 2013. Effect of concentration, time and frequency of foliar applications on vegetative growth and production of replacement corms of saffron (Crocus sativus L.) by using a complete nutrient solution. In: Proceeding of the 2nd National Conference on the Newest Scientific and Research Findings on Saffron. Torbat Heydariyeh, Iran, October 30, 2013, p.40. (In Persian). Koocheki, A., Jahani, M., Tabrizi, L., and Mohammad Abadi, A.A., 2011. Investigation on the Effect of biofertilizer, chemical fertilizer and plant density on yield and corm criteria of saffron (Crocus sativus L.). Journal of Water and Soil 25: 196-206. (In Persian with English Summary). Koocheki, A.R., Fallahi, H.R., Amiri, M.B., and Ehyaei, H.R. 2015. Effects of humic acid application and mother corm weight on yield and growth of Saffron (Crocus sativus L.). Agroecology. (In Press) (In Persian with English Summary). Kumar, R., Singh, V., Devi, K., Sharma, M., Singh, M.K., and Ahuja, P.S. 2009. State of the art of saffron (Crocus sativus L.) agronomy: A comprehensive review. Food Review International 25: 44-85. Molina, R.V., Valero, M., Navarro, Y., Guardiola J.L., and Garcia-Luice, A. 2005. Temperature effects on flower formation in saffron (Crocus sativus L.). Scientia Horticulture 103: 361-379. Rezvani Moghaddam, P., Koocheki, A., Molafilabi, A., and Seyyedi, S.M. 2013. Effect of biological and chemical fertilizers on replacement corm and flower yield of saffron (Crocus sativus L.). Iranian Journal of Crop Science 15: 234-246. Sabet Teimouri, M., Kafi, M., Avarsaji, Z., and Orooji, K. 2010. Effect of drought stress, corm size and corm tunic on morphoecophysiological characteristics of saffron (Crocus sativus L.) in greenhouse conditions. Journal of Agroecology 2: 323- 334. (In Persian with English Summary). Sadeghi, B. 2012. Effect of corm weight on Saffron flowering. Proceedings of the 4th International Saffron Symposium. Keshmir, Iran. Sadeghi, B., Hosseini, M., Masroori, M., and Mollafilabi, A. 2013. Effect of nutrition in bed on enlargement of saffron corm. Research Project for Institute of Food Science and Technology. Khorasan Razavi, Iran. 23p. (In Persian).